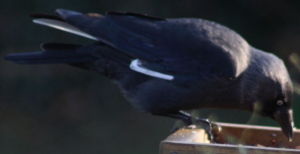 Observation - Jackdaw with white patches - UK and Ireland. Description: Jackdaw with white patches on wing and tail feathers. Jackdaw with white patches on wing and tail feathers.